Steward of Savings : FREE Cappuccinos, Hot Coffee, Hot Tea, Iced Coffee, or Hot Chocolate at Cumberland Farms! 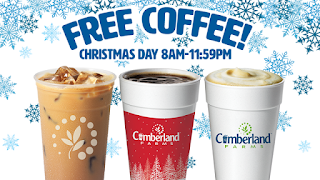 FREE Cappuccinos, Hot Coffee, Hot Tea, Iced Coffee, or Hot Chocolate at Cumberland Farms! Go here for details>> FREE Cappuccinos, Hot Coffee, Hot Tea, Iced Coffee, or Hot Chocolate at Cumberland Farms!